In this Windows 7 guide, Windows users will find step by step documentation in order to turn on games on Windows 7 computers. In some of the Windows 7 editions Windows games like Solitarie, Minesweeper, Purble Place, Mahjong Titans and many others do not exist by default. By the way here is the list of Windows 7 games existing on the latest OS released by Microsoft. Windows 7 Professional edition is a sample where Windows games are not installed by default. 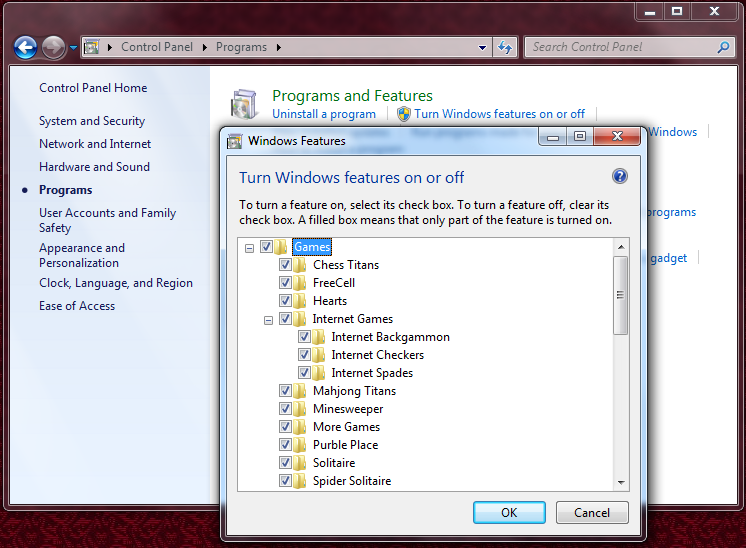 In Windows 7 computers where Windows 7 games are not enabled by default or are not installed, although there is a Games program group on the Windows 7 Start menu, the Games program group is empty. So many Windows users complain that games are missing on Windows 7 and asking where are Windows games on Windows 7 computers. Actually Windows games are installed or configured in your operating system. So do not worry there are no missing Windows games. Because Windows 7 installation preconfigures and downloads all required bits for Windows 7 games on your computer. The only thing that you should do is to enable or turn on games feature on Windows 7 Programs Control Panel. Follow the below steps for enabling games or to turn on Windows games on a Windows 7 PC. Then click on Control Panel on the Start menu. Find Programs section in Windows 7 Control Panel or click on Programs section link on the left. In "Programs and Features" section of Control Panel, click "Turn Windows features on or off" link. Scroll down till Games checkbox on the list. Mark Games to install all games or drill-through Games and select / deselect Windows games you wish. After your selection is completed click on OK button and exit from Control Panel. After Windows makes changes to Games features and process is complete, you will see the missing Windows games under Games program group of your Windows 7 operating system.